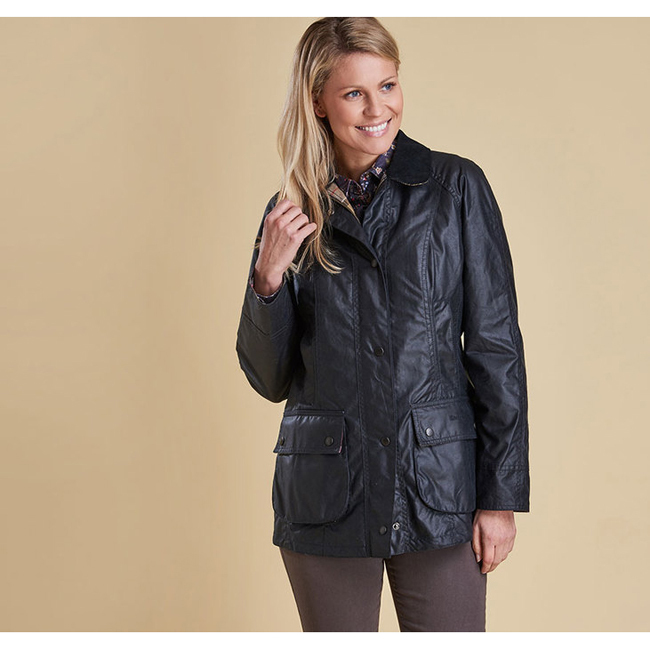 The Beadnell Waxed Jacket is based on the iconic men's jacket the Bedale and popular with women of all ages. The Beadnell is made with Barbour's signature 6oz waxed cotton which incorporates the classic elements of a Barbour jacket including a brass two-way ring-pull zip, studded 'Stormfly' front, two large pockets lined with traditional Barbour Tartan, two moleskin-lined hand warmer pockets, and the traditional corduroy collar. The Beadnell has a classic look, shaped to be elegant with two studded rear vents to add comfort and create a feminine silhouette when worn. Suitable for wear all year around, compatible with the Betty Interactive liner to add warmth and a wax cotton hood. The Bedale has a wax satin finish and is available in five colours and a wide range of sizes.